There it is: one of the classic billboard shots for Slovakia’s hiking: the strange twisting path through the wooded chasms of Slovenský Raj, or the Slovak Paradise. Chances are that if you come to this country, want to see the best of it and have time to do so then you’re going to be doing some hiking: either in the afore-mentioned National Park or up in the High Tatras, most likely. And you should not – ever – take to the trails in Slovakia’s national parks without a map. Out in Slovakia’s wilds it’s not a couple of hills with some nice restaurant waiting on the other side: it’s wild, guys – as in Scottish Northwest Highlands wild and then some. And it is very easy to lose your orientation with all those trees everywhere! So: maps. The green-coloured 1: 25,000 and 1: 50,000 VKÚ Harmanec maps are what I have found best. They are the ideal level of detail and come in plastic cases. I find the most comprehensive selection is in Bratislava’s Martinus bookstore, and there’s a branch with a nice cafe on Obchodná right by Poštová tram stop in the centre. Panta Rhei also have maps. 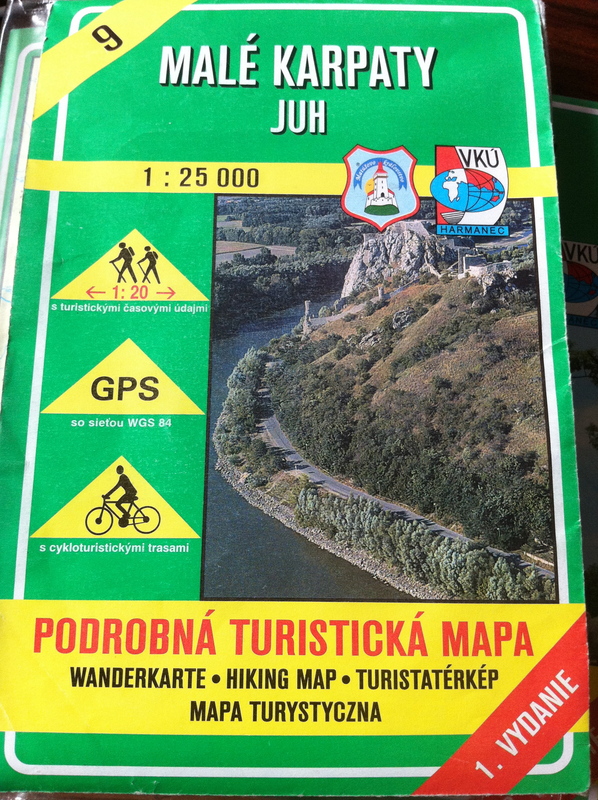 They’ll always have the Malé Karpaty (those hills just outside Bratislava) and the main national parks in stock. And, a discovery I made the other day: there’s now a Slovak Hiking app out (search for Turisticka Mapa in your app store, the creator is Daniel Tekel). It’s basically a close-up map of the country with hiking paths highlighted and other detail faded out slightly. As long as you are going along a marked trail (most good hiking in Slovakia is along marked trails anyway) it’s pretty accurate – although at the admission of the creator, not all close-up terrain detail is shown, so if you do accidentally stray off the marked trail you may have probs. But it is a good back-up resource and with a blue dot to indicate if you are, indeed, where you think you are, you probably won’t go too wrong. The app is free; additional features such as tracking your route cost an extra 69 pence.